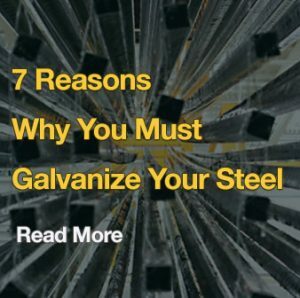 Galvanized steel is all around us and plays a vital role in our everyday lives. It is used in construction, transport, agriculture, power transmission and everywhere that good corrosion protection and long life are essential. It, for instance, helps light our roads (lighting columns) and provide power for our homes, hospitals and offices (high voltage pylons). There are many other important industries that make use of galvanizing. A large proportion of galvanized steel is used in construction. However, it is a very versatile process and articles ranging in size from nuts and bolts to large structural sections can be protected. Galvanizing is a corrosion protection process for steel, in which the steel is coated with zinc to prevent it from rusting. The process involves dipping cleaned iron or steel components into molten zinc (which is usually around 450°C). A series of zinc-iron alloy layers are formed by a metallurgical reaction between the iron and zinc creating a strong bond between steel and the coating. Hot dip galvanizing protects against corrosion and prolongs the life of steel, greatly lowering the environmental and economic cost. To find out more about galvanizing and sustainability from our technical experts, book our RIBA approved ‘Galvanizing and Sustainable Construction CPD‘. 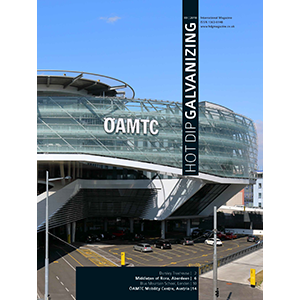 Inputs, emissions, wastes and recycling flows in the galvanizing process.